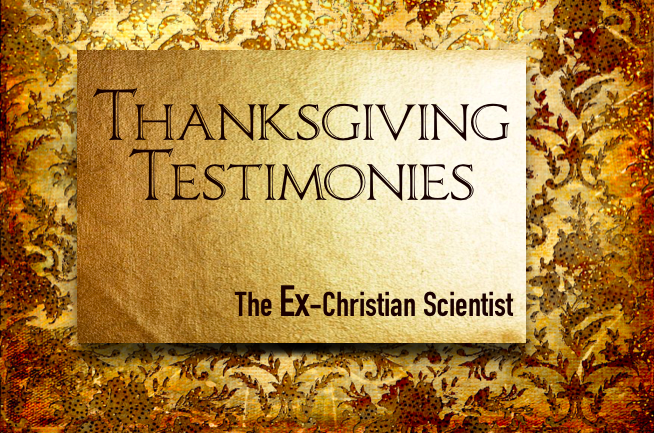 The following are testimonies from Ex-Christian Scientists, as they give thanks for having left Christian Science. Thank you all for your contributions! 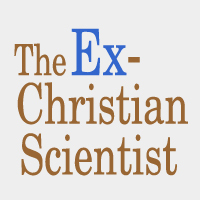 We at The Ex-Christian Scientist offer no readings, or lengthy proclamations, merely our sincerest thanks for everyone who has contributed to our efforts. All Thanksgiving posts are tagged Thanksgiving. I’m grateful for another year of personal development. I’m slowly coming to terms with being an imperfect human who makes mistakes and feels anger, sadness and other negative emotions instead of repressing them. I’m grateful because instead of agonizing and worrying when I feel unwell, now I just book an appointment with my wonderful doctor who listens to how I feel and validates my emotions. I’m grateful for antibiotics that cured a serious kidney infection in a couple of weeks while I rested and watched movies (instead of reading the bible lesson and feeling guilty for having allowed my thoughts to make me sick). Also, I’m grateful because my daily reading is for pleasure or education. Not to protect my thoughts from a dodgy dark entity. But mostly I’m grateful for the freedom that comes with knowing that It’s normal to be less than perfect. I feel less guilt and more peace than I ever did before leaving the CS church. I am thankful to the Princess Cruise Line and their medical Team, along with the Portuguese Military and the medical team in the Azores for saving my life. It is my feeling that my super high pain threshold due to past adherence to CS that made me not know that I had appendicitis. If I was aware of my “bodily matter”, I wouldn’t have inconvenienced so many people on the Atlantic Ocean and the Caribbean Princess. I am thankful that when CS couldn’t heal, but could kill; I was able to give myself over to medical professionals to save my life. I never gave a Thanksgiving testimony, but every year for my entire childhood, our family started with the 11 am Thanksgiving Church Service, which of course was right on the heels of the Weds. eve Testimony Service. My father was First Reader for many of those services, which we all were forced to attend, and look happy about it – no, BE happy about it – upon pain of punishment. Because if I didn’t enjoy church, clearly, there was something wrong with me that I needed to fix. I remember one year after the service, around age 7, we at the kids’ table were given apples, toothpicks, and gummy candies to make apple “turkeys.” You pierce the gummies with the toothpicks, like little candy kabobs, stick them into the apple in a fan pattern for the tail, then add toothpicks for the turkey neck and feet. We had just heard Baroque music at the Thanksgiving Service, and I asked the organist, What is Baroque? She said, “It’s a kind of art that is full of embellishments. There is no blank space in Baroque style, everything is filled with a flourish or an ornament.” Thus began my still-strong love affair with the music of J.S. Bach. Her comments had impressed me, as had the Bach, and I was inspired to make a Baroque-style apple-gummy turkey! I stuck as many gummy candies as I could fit onto my toothpicks, and made the most ornate, embellished apple-turkey possible. Suddenly, I felt an unfriendly, firm hand yank my arm away from my project. My father towered above me, and dragged me into a dark corner far away from our lovely respectable guests, where he pinched me and twisted my arm while calling me “wasteful, greedy, immature” for using too much candy on my apple-turkey. I remember staring at him with no expression – because if i showed any expression, my disdain would be visible and I’d get whipped later for sure — and I thought, “If we didn’t have guests over, you’d be beating me for this, which is totally hypocritical for a First Reader,” and then I thought, “You’re so stupid. You can’t even tell the difference between a Baroque artistic experiment and greed.” Followed by deep loneliness, because my Dad was an artist, too, and I thought that if he knew of my Baroque inspiration, he would have loved it. It took me years to identify this kind of interaction for what it is: projection. So, to end my fun reminiscing, I am deeply in awe of the resiliency of my own spirit, and thankful to the health professionals, spiritists (not all of them are quacks – sometimes people can see things that lie outside the experiential or socially acceptable “norm” and that doesn’t make them charlatans or crazy) … to the good friends and seekers with open minds and hearts who have witnessed me cross the bridge between brainwashed, punished and in denial of my physical experiences, into a life where I am empowered, accepted, and acknowledged for my whole human experience: body, mind, spirit, gifts, problems, blessings, the whole thing. Thanks for listening, and Happy Thanksgiving! Content… and mad, nice guy… rude cad. Good health… get sick, recover… not so quick. Smooth patch…. rough sled, run fast… in bed. Upright… laid low, we reap… we sow. The lights and shadows, ups and downs…. They’re ALL ok! “Who knew?” I say. I can embrace it all, and thrive! Our daily bread while we’re alive. And keep it! It’s a big mind trap! To make us think perfection’s real. Instead of all that makes us feel? To know the truth of TRUE insight. This Thanksgiving, I would like to express my gratitude for not having to constantly police my own thoughts. I was raised in Christian Science. At Sunday School, they taught us that our thoughts can affect the world around us. They said that positive thoughts would have positive effects, and negative thoughts would have negative effects. Because of this, I was told, it was important for each person to police their own thoughts. This was called “standing porter at the door of thought.” I remember they taught me to continuously monitor everything I was thinking. They told me that, if a negative thought entered my head, I had to immediately reject it. If I didn’t, bad things would happen. “Standing porter” was awful. It brought a new level of stress to everyday activities. If I went to see a play, I had to concentrate on believing positive things about the actors, for fear of causing them to forget their lines. If I watched a game of baseball on TV, I had to concentrate on believing positive things about the players. The game might be happening hundreds of miles away, but I was still afraid that I might accidentally affect the outcome of the game. Now that I’ve left Christian Science, the fear is gone. The constant mental burden is gone. I am grateful for the real world we live in, a world in which my thoughts cannot affect the world around me — but my actions can! This concludes our Thanksgiving post. Please feel free to contribute any additional testimonies in the comments below. Please note any comments left on Thanksgiving day will be approved on Friday 11/23. All comments are screened, please view our Comment Policy if you have any questions. I am grateful today for an abundance of things. I am so excited to share my fruitage this year, on Thanksgiving Day! First off, I am grateful for the fact that I get to spend the whole day at my own house and I don’t have to go out to hear the Proclamation from the President of The United States at my church service. I hear too much from him already, so I am grateful to have this day off, so I can watch the Macy’s Thanksgiving Parade, which is our new annual family tradition. I am sad this year because so many of my friends have died way too young, and too many of those who died were Ex Christian Scientists. One of my Ex Christian Science friends was 11 months older than I am, and she died because of Cardiomegaly, which means her heart was literally too big and it exploded. I believe a simple Xray and follow up tests could have let her know that a heart surgery was possible to avoid shattering the lives of those around her. We all miss her terribly. She was in her mid 40s. Her funeral was beautifully done with an open casket and so many attendants at the funeral home, that it had to be streamed to another room there. I have, in the last month, also started having heart issues. I was so scared and ended up in the Emergency Room. My husband drove me there. Usually, I worry that I am overreacting. But with the symptoms I am having, they told me “next time you have these, call 911; don’t come here on your own, you may not make it.” I am so glad for the nurses and doctors and interns and staff at the local hospital who did everything they could to make sure I will be ok. I am grateful for IV bags filled with electrolytes, I am grateful for blood tests and Xray machines. I am ready for heart monitors. Speaking of which, I now have a newfangled heart rate monitor stuck to my chest with stickers and it talks to a cellphone that came with it, so I have professionals keeping their eye on my heart beat and heart rythms 24/7 for the next month. I am also grateful for heart pills that have kept a friend of mine alive, and I am grateful for open heart surgery, which has enabled my grandpa and my kids to know each other. I am grateful for all the former Christian Science churches that are now becoming apartments and restaurants and bars and other things. I am grateful for every church that closes and helps to free more people of the mind control and brainwashing they have been subjecting each other to. And, one more thing – I am grateful for my kids, their generation, and the fact that so many of them are able to vote now. My kids are getting to voting age quickly now, and I am glad they are coming of age in a time when the idea of voting is being pushed “out there” as vitally important for everyone to do! I wish everyone a happy Thanksgiving! I appreciate each one of these Thanksgiving testimonies. I can relate to so much. I’m also slowly understanding the facts and the benefits of being a flawed human. And having a high pain threshold because of all those years of suffering without medicine–sadly, that’s so true. The Baroque turkey is awesome. The poem is awesome. I’ve also struggled with “standing porter,” so much so that I still have to remind myself that I can think whatever I want to! I’m grateful that this Thanksgiving I could just loll about in bed while the cat sat on me and purred. When I got up, I read part of the Cather-Milmine biography of Mary Baker Eddy, which I just got from the library a few weeks ago. I’m in the chapter where Mr. Eddy and Mr. Arens try to have Daniel Spofford killed, and I just shake my head at all the crazy. I’m very, very grateful I don’t have to idolize Mary Baker Eddy anymore. Now I can admire other, genuinely ethical people who truly benefited humanity. I’m grateful I found this website. I’m grateful for the stories shared and for the book recommendations. I just finished reading God’s Perfect Child by Caroline Fraser. Wow, that book helped me. Three years since I left CS, but I still have a lot to work through, and this community helps immensely. Wow; I have a copy of the Cather-Milmine book “Mary Baker Eddy” and I Haven’t read it yet. Wow; MBE trying to have him killed. That’s amazing! I need to read that book. I am 4 years out now, and the first 3 years were the hardest for me. I’m in a much better place now than I was then. I HAVE HAD A VERY DIFFICULT TIME LEAVING CHRISTIAN SCIENCE, AND I STILL CANNOT 25 YEARS READING SCIENCE AND HEALTH 7 TIMES COVER TO COVER . WORKING WITH CSB’S AND CS PRACTIONERS, NOT GETTING HEALED,BEING BLAMED, PRACTIONERS QUITTING ON ME, AND MY LASTEST MY PRACTIONER OF YEARS THAT IS HAVING ISSUES AND IN A CHRISTIAN SCIENCE HOME FOR THE AGING I GUESS .YET HE WONT SHARE HIS PROBLEMS WITH ME. I NEED SOME HELP FROM ANYONE OUT THERE PLEASE . I LOST MY DAD IN 2007, AND MY BEST FRIEND MY MOM THIS PAST THANKSGIVING 2017. I just want to encourage you and let you know you are not alone in your struggle. I left C.S. about 18 months ago after being in it for part of my childhood and my entire adult life. I understand your fear, as I too was afraid to leave. I was terrified as I felt if I left I would die. I know that each path out is an individual process but for me 1 Cor. 1:12-13 was helpful. I no longer identify as C.S. or as a follower of MBE. I no longer follow the rules and bylaws of C.S., I just belong to Jesus. Your suffering, pain and fear are real. I am so sorry you are experiencing them but your experience is valid and so important. I hope you know that. One of the most painful things about Christian Science for me was the fact that it denied all of my suffering, pain and fear. I remember the first time some said to me that those feelings were real and legitimate – I broke down crying because it was such a relief just to have those feelings acknowledged. Do you have Audible? I really recommend Kristen Neff’s book called Self-Compassion. I have found it to be a wonderful antidote to all the horrible thought-processes that being raised in Christian Science instilled in me. I am sorry you are struggling- I am sure it is so painful for you. Oh Michael, my heart is breaking for you! I deeply feel your pain, partly because I lost my own Mother a few years ago. It was the worst thing that ever happened to me. I was able to get out of the lies of cs when I was 12 years old, but I do remember the the lingering guilt that I experienced. Fortunately, my Mother who was the one that started me in the Sunday School, had no problem with my desire to “get out”. My Father couldn’t care less what church I attended; he and my Mom were not church-goers; but were wonderful parents and raised me in a ethical, loving home. It would take way to long to tell my story, but I just want you to know that the True God loves you and will help you heal from all the lies that were forced on you. Through a journey over many years and different churches, I have found my true home in Catholicism, and for me, I am totally at peace. I will never suggest a church for anyone unless asked, but I will say that I am now a senior citizen and have finally found peace. You are in my prayers, this I promise. CS as you know it is actually a form of hypnotism as well as a game of chicken so to speak. All the CSB’s, and CS’ers already know that it is not healing anyone and yet they need the “license” to practice. Do your self a favor and find the nearest professional help in your community. Let them know you have been brainwashed. You can take baby steps but please take one at a time. Love and support to a new day for you! we discovered was mentally ill. I have always found the teachings very narrow, however sort of logical. I have never been able to leave CS although I aven ‘t attended the church for over 40 years. Now I feel it’s God,s will for me to return. I have neglected my health because of the guilt. Because of my neglecting my health I haven’t been able to save for a pension. Is there someone I could write to who could guide me in this? I see you have an email address. Hello friends, I too was a life long CS and attended Principia for 10 years. It broke my Mother’s heart when I left CS but it never felt right to me. I loved the Bibke study but was frustrated over reading only snippets. I never cared for Science and Health as it appeared to be to be manipulative of truth. Again, snippets of truth. Luckily, I decided to study classic Christianity with the same fervor and dedication taught in CS. Here I learned we are not supposed to be perfect; we are loved on our imperfection. What a tremendous burden lifted that was! To be forgiven fir all my failures and at the same time, loved with an everlasting love: that was the promise I had sought in CS but never found! So beloved fellow seekers, my recommendation is to see the God who loves you more than you can imagine, and be at peace with Him. He will lead you into all truth. You don’t need CS to guide you. The truth is Jesus Christ is the only perfect one. You were not created to be perfect. You were created to love God. Jesus leads you gently and lovingly, with deep affection, to the Father, Mother, God you seek. Ask God to show you and He will honor that request. Trust Him. He loves you and wants you to be free.